London is a dream location for city dwellers who like outdoor swimming, which is often a difficult combination. 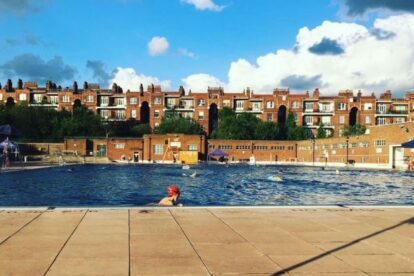 It offers a number of lidos, as well as more unusual swimming spots – such as the Hampstead Heath ponds (check my article), to keep swimmers happy. The experience of open air swimming, for me, is worlds away from swimming in an overheated, over-chlorinated and over-packed indoor pool. And it’s an experience that brings a number of benefits – recent claims have stated that it improves mental as well as physical health. Parliament Hill Lido is my favourite of the London lidos. The lido first opened in 1938, and is now a grade II listed building because of the classic art deco style. The 61m pool is lined with stainless steel, giving it an attractive ethereal sheen. It is one of three unheated swimming spots that stay open all year round – though the water temperature has been known to drop to 2 degrees in January (brr! ).